RezSaver's BackOffice management system allows managers to control what products are promoted to their agents, and therefore their clients. 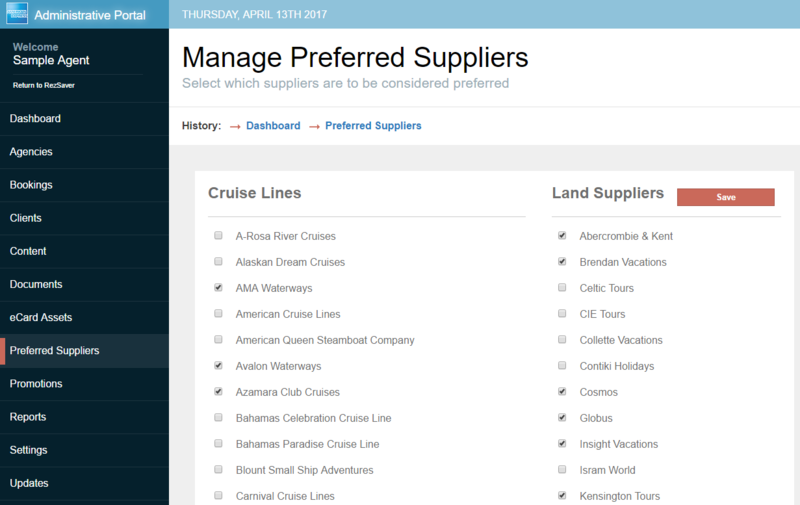 By setting up preferred suppliers, managers guarantee that agents will see preferred suppliers products first in searches. BackOffice makes it easy to manage these suppliers as your business needs change. Running a special with a certain vendor for a limited time? No problem. Just add them as a preferred supplier, then deselect them at the end of the promotion. The supplier's information will be saved for future use in case they will be marked preferred again. Managers can also set up custom promotions for certain suppliers, using RezSaver BackOffice's custom promotions section. It's never been so easy to customize suppliers and promotions for an agency!